There's so many Arduino's out there, it may get a little confusing. We wanted to clarify for people some of the changes in the latest version. NB this is just our opinion and interpretation of some of the decisions made by Arduino. We aren't associated with Arduino, and don't speak for them! If you have to get an Official Response to your Arduino question please contact them directly. Thx! NB2 Still in progress, we're collecting common questions to answer. If you have more questions, please post them in our forums. But first…some history! First there was the serial Arduino (what's the name of it?) with RS232 which was not used outside of the Arduino team & friends. The first popularly manufactured Arduino was called the NG (New Generation, like Star Trek, yknow?) The NG used the Atmega8 chip running at 16 MHz and an FT232 chip for the USB interface. The bootloader takes up 2KB of space and runs at 19200 baud. The next version was the Diecimila. The Diecimila updated the chip from the Atmega8 to the Atmega168. The great thing here is double the space and memory (16K instead of 8K). It still ran at 16MHz. The Diecimila also added two extra header pins for 3.3V (from the FTDI chip) and the reset pin which can be handy when a shield is covering up the Reset button. The bootloader takes up 2KB of space and runs at 19200 baud. Auto-resetting was also added which makes life awesomer for everyone. In 2009, the Duemilanove was released. This one also upgraded the chip again, to the Atmega328. Yet another doubling of space and memory! Another upgrade is now the power is automagically switched between USB and DC-jack which removed the previous jumper. This makes it easier and faster to move from programming to standalone and got rid of some confusion. The bootloader takes up 2KB of space and runs at 57600 baud. In 2010, we have the Uno! The Uno still uses the 328P chip and the power switcher. It has a smaller bootloader called OptiBoot (more space for users' projects) that runs at 115K. So even though the chip is the same, you get another 1.5K of extra flash space that was previously used by the bootloader. The FTDI chip has also been replaced with a atmega8u2 which allows for different kinds of USB interfaces. Finally, there's an extra 3.3V regulator (LP2985) for a better 3.3V supply. whew! So! All of the older Arduinos (NG, Diecimila and Duemilanove) have used an FTDI chip (the FT232RL) to convert the TTL serial from the Arduino chip (Atmel ATmega). This allows for printable debugging, connecting to software like PureData/Max, Processing, Python, etc. etc. It also allows updating the firmware via the serial bootloader. The good news about the FT232RL has royalty-free drivers and pretty much just works. The bad news is that it can -only- act as a USB/Serial port. It can't act like a keyboard, mouse, disk drive, MIDI device, etc. The Uno has changed that by exchanging the FT232RL chip with an atmega8u2 chip. There are a few things that are possible with this new chip but before we discuss that lets make it clear that by default, this chip acts identically to the FTDI chip that it replaces. It's just a USB-serial port! The big thing that is nice about the 8u2 is that advanced users can turn it into a different kind of USB device. For example it can act like a keyboard or mouse. Or a disk driver. Or a MIDI interface, etc. Right now there are no examples of how to do this, but we hope to post some shortly. And, finally, going with the 8u2 reduced the price of the board which made up for some of the other extras. Why not just go with a atmega32u4? How can I change the USB firmware? Does the Uno use a resonator or a crystal for the processor clock? So the Arduino is not as precise, timing-wise? Why not have one 16Mhz crystal shared between both? Good question, technically you can. However, in practice the board did not make it through FCC certification with one crystal (long traces with fast squarewaves = lots of noise). You can absolutely connect the CLKO out the crystal from the '8u2 to the '328p but you're on your own as we don't think there will be any tutorials about that. Whats with the FCC logo on the back? It is also, still, CE certified for Europeans. There's a new bootloader. It works just like the old one - being an STK500-protocol compatible but its a quarter of the size! Down from 2K, the new bootloader is a tiny 512b. This gives you more space for your project code! Yay! It's also faster - 115K instead of 57.6k so you'll be uploading code in 3 seconds. The Bad News is that you must make sure to select Uno in the Boards menu!!! If you don't things will be confusing because the bootloader speed is wrong, and you won't get that extra 1.5K! Overall, its a good direction, and the chips can be used in older Arduinos just fine (so you can upgrade your Diecimila or Duemilanove to the Uno by simply replacing the chip). For more detailed information about the bootloader, such as source code, please visit the Optiboot project page. Why not just use the '8u2 as a programmer? How does the new '8u2 affect Arduino-derivatives? Every USB device needs to have a unique product id and vendor id. Vendor IDs (VID) are sold to companies and Product IDs (PID) are chosen by that company. So for example FTDI owns VID #0403 and they give their chips ID's between #0000 and #FFFF (65,536 different PIDs) Older Ardiuno's used FTDI's VID/PID as that is part of the deal when you purchase their chips. Because the Uno does not use an FTDI chip anymore, the Arduino team had to purchase a USB Vendor ID (VID). Every Arduino product will now have their own PID starting with the Uno (#0001). However, you can't use the Arduino VID when distributing your own Arduino-compatibles! If the cost of a VID is too much for you, simply go with an FTDI chip, K? I tried to find a place to buy some '8u2s and couldnt locate any! Yep, there is a worldwide shortage of Atmel parts right now. Even the chip used in the Arduino core (Atmega328P) is really hard to get. This happens after recesssions. We hope that these and other Atmel chips will show up again in places like digikey soon. Till then, keep searching on findchips.com! So does this mean there may be an Arduino shortage? Did the Arduino team move from the FTDI chip to the '8u2 to screw over derivative-makers? Are Shields still going to work? All previous shields should still work perfectly fine as the header spacing is the same, the core chip is the same and the location of parts is the same. In fact, some should work better because the 3V supply has been upgraded (see next point). Will enclosures, plates, etc still work? Yup! The Uno is physicially the same size and layout as previous Arduinos. The mounting holes are in the same location. There is an additional mounting hole as well, now. One sad thing about older boards is that they had a 3.3v power supply but it was really just whatever the FTDI chip's internal 3.3v regulator could give. You -could- get 50mA out of it, maybe. But high power stuff like XBees, SD cards, some fast ADC or DACs could easily drag down the FTDI chip and reset the USB connection. The Uno solves this problem by adding a new 3.3V regulator the LP2985 which can easily provide 150mA. The LP2985 is a very high quality regulator, and will work great for powering stuff and as a nice solid 1% analog reference. Why is the Arduino chip running at 16MHz when it can run at 20MHz? This is a common question. The reason is that the first Arduino used the Atmega8 which could not run faster than 16Mhz. As the chip has been upgraded they wanted to make the boards speed compatible. Arduino is also not really intended for fast-processing (its only 8-bit anyways) so the chips are running at 16MHz. Is it still Open source hardware and software? Yes! The Uno is still available under a Creative commons license. You can get the latest schematics and layouts over at the Arduino website. During fall of 2011, the Arduino team revealed that there will be a new minor revision of the classic Arduino, the "UNO R3" (revision 3). A lot of people have asked us about the R3 so here is everything we know so far. The UNO R3 is not available to resellers until December 1st or so. Really! Nobody has them until then! The USB controller chip has moved from an atmega8u2 (8K flash) to an atmega16u2 (16K flash). This does not mean that you have more flash or RAM for your sketches this upgrade is for the USB interface chip only. In theory this will mean that it will be easier to have low level USB interfaces such as MIDI/Joystick/Keyboard available. However these are only theoretical at this time, there is no example code or firmware which will actually do this. There are three more breakout pins on the PCB, next to the AREF pin there is are two I2C pins (SDA/SCL) - this is a duplication of the Analog 4 and 5 pins. There is not an extra I2C interface or anything, its just that they made a copy of those pins there for future shields since the I2C pins are in a different place on Mega. There is also an IOREF pin which is next to the Reset pin - this is to let shields know what the running I/O pin voltage is on the board (for the UNO, its 5V). Again, this is a duplication of the power pin, it does not add voltage level shifting to the UNO. The RESET button has moved to be next to the USB connector, this makes it easier to press when a shield is on top. If you want to get up an Arduino R3 now, visit the adafruit store and pick up a board or pack! Need Help Installing a Library? Libraries are great places, and not yet illegal in the United States! If you ever need to learn how to do something, like say fix a motorcycle, you can go to your local library and take out a book. Sure you could buy the book but the library is nice because as a resource you can get the book whenever you need it, keeping your house uncluttered. Software Libraries are very similar. We already studied what a procedure is, in lesson 3: a procedure is a list of things to do. A library is a big collection of procedures, where all the procedures are related! If you, say, want to control a motor, you may want to find a Motor Control Library: a collection of procedures that have already been written for you that you can use without having to do the dirty work of learning the nuances of motors. One of the best features of the Arduino project is the ability to add on pre-crafted libraries that add hardware support. There's tons of them, and you can pick and choose which to install. They're only loaded in when the sketch you're working on needs them, so for the most part you can download and stash them for future use. A library is a folder with some files in it, the files will end in .cpp (C++ code file) and .h (C++ header file). There may also be some .o files. The .o files are C++ compiled Objects. If you end up working on the library and modifying it, be sure to delete the .o files as that will force the Arduino IDE to recompile the modified .cpp's into fresh .o's. Two optional files you may see are keywords.txt (this is a hints file to tell the Arduino IDE how to colorize your sketch and examples folder, which may have some handy test-sketches. These will show up under the File→Examples→Library dropdown. In Arduino v16 and earlier, libraries were stored in the ArduinoInstallDirectory/hardware/libraries folder, which also contained all the built-in libraries (like Wire and Serial). In v17 and up, the user libraries are now stored in the ArduinoSketchDirectory/libraries folder. You may need to make the libraries sub-folder the first time. However, the good thing about this is you wont have to move & reinstall your libraries every time you upgrade the software. For example, here is how it looks when NewSoftSerial is installed in Windows (of course your username will be different). On a Mac, your arduino sketch folder is likely going to be called Documents/arduino so create a NEW FOLDER inside that called libraries and place the uncompressed library folder inside of that. Check that the Documents/arduino/libraries/MyNewLibary folder contains the .cpp and .h files. After you're done, restart the Arduino IDE. This is some advanced bootloader tweaks - 99% of Arduino users should not mess with their bootloader! Only for the wild at heart! Here is the package for a 'fixed up' ATmega328 bootloader. To program it you may need to change the Makefile's ISPTOOL, etc definitions. The commands are make adaboot328; make TARGET=adaboot328 isp328 (I couldn't get the default 'isp' target to work so I made a new one). This version has a few fixes: first it integrates the 'no-wait' and 'no-hang' fixes below. It also fixes the annoying "missing signature bytes" bug that freaks out avrdude when programming without the IDE. I also repaired the EEPROM code so that now you can upload and download the EEPROM memory as well as flash. Finally, theres a 'upload feedback' using the LED, for arduino clones that don't have TX/RX leds. Please note that the fuses are different for this chip because of the extended memory! Here's a bootloader hack that will automatically start the sketch after it has been uploaded and will also only start the bootloader when the reset button is pressed (so when you plug in power it will go straight to the sketch). // Check if the WDT was used to reset, in which case we dont bootload and skip straight to the code. woot. You can also just grab the source code and compiled hex file here. It will work in NG or Diecimila Arduinos. If you are using a Diecimila with auto-reset you may be frustrated when your communications program accidentally triggers the bootloader. Here is a quick hack to make the bootloader quit if it doesn't receive a '0' character first (which would indicate the Arduino software is trying to talk to it. // the first character we got is not '0', lets bail! The bootloader is an 'stk500'-compatible, which means you can use good ol' AVRDUDE to program the arduino. Just plug in the USB cable, then press the reset just before you start avrdude. If you need an avrdude tutorial, check out this page. 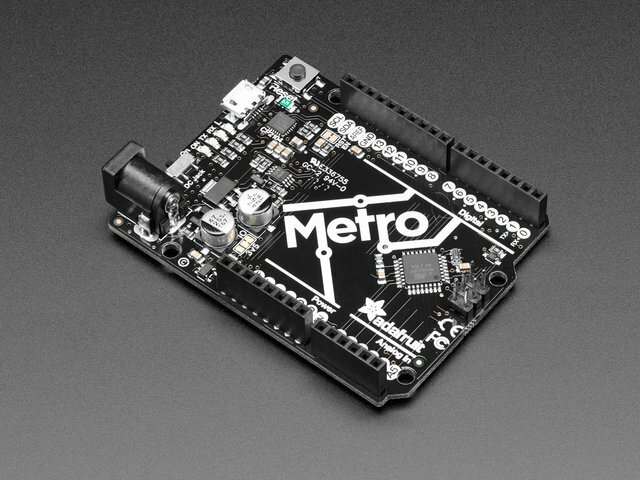 The 'brains' of the Arduino is a microcontroller called an ATmega. It is a product line from ATMEL (a Norweigen chip company). Just like Intel & AMD release new & better chips each year, so does Atmel. The first versions of the Arduino (up to the NG) used an ATmega8 - a chip with 8K of flash memory and 1K of RAM. Then Atmel released the ATmega168, a drop-in replacement with 16K of flash and 1K of RAM - a really big improvement! Now there is the ATmega328 with 32K of flash and 2K of RAM. Updating and replacing your Arduino is easy and painless and costs only a few dollars. Your sketches will work just as before but with a little more breathing room. In order to perform this upgrade you will have to either purchase a preprogrammed chip or program it yourself with a AVR programmer or by 'bitbanging' it. First, gently pry the Arduino microcontroller from its socket using a small flat screwdriver or similar. Try to make sure the pins dont get bent. Put it in a safe place. Preferably in an anti-static bag. Next, prepare the new chip. The pins of ICs are a little skewed when they come from the factory, so they need to be bent in just a tiny bit, to be parallel. Grip the chip from the ends and use a table. Finally, replace the old chip, lining up all the pins and making sure that the notch in the chip matches the notch in the socket! Version 13 and up of the Arduino software supports the 328! If you're having problems please try BOTH just in case! All official Arduinos run on 5 volts, which for a long time was the 'standard' voltage for hobbyist electronics and microcontrollers. But now the coolest new sensors, displays and chips are 3.3V and are not 5V compatible. For example, XBee radios, and SD cards and acellerometers all run on 3.3V logic and power. If you tried to connect to them with 5V you could damage the internals of the accessory. We use chips like the CD4050 to do level conversion but if you are using a lot of 3.3V devices, maybe you're just better off upgrading the entire Arduino to run from 3.3V! To do that, we will replace the regulator so that the DC barrel jack goes to a 3.3v type regulator, not a 5V. And then reconfigure the 5V usb power line so it goes through the regulator as well. You can get these from any electronics component shop, for example here is the digikey link. To start, we'll need to remove the old regulator. The easiest way to do that is to first clip the two legs. Then you'll need to heat the tab up to get it liquid so you can lift off the old part. Although it may seem counter intuitive, its best to add some solder to the tab, melt it on with your iron, this will improve the heat conduction since the tab is so large. Clean up the tabs and remove any clipped parts still stuck on. Now line up the new 3.3V regulator, and solder the tab first, use plenty of solder and be patient, the tab acts like a heat sink. Then do the two legs. The next part is a little tricky, the USB jack gives us exactly 5V already, and normally that is tied to the output of the voltage regulator (essentially, its got a little circuitry that connects it when the DC jack is not powered). The easiest way to make the USB 5V also go through the regulator is to remove the fuse and solder a diode from the USB output to the regulator input. You can use any power diode, a 1N4001 is perfect and only a few pennies. The trade off is now there is no 500 mA fuse for the USB jack. The good news is that computers will have their own fuses on the USB connector (inside the computer) so its not likely you will destroy your PC. But be aware that you're losing a little safety. Heat the fuse with your soldering iron, again adding solder may help thermal conductivity. Since the fuse is very conductive you can probably just heat one side for a while and both ends will melt. Clip the diode short and bend the leads over. Solder the side without a stripe (anode) to the old fuse pad, nearest the board edge. Solder the striped end (cathode) to the right hand leg of the regulator. The Arduino will still automatically select whichever power plug is giving you more power. That's it! You are now 3.3V powered. This is a little lower than the power/frequency specification for the AVR chips since they ought to have about 3.6V to run 16Mhz but its probably not going to be an issue since AVRs can be overclocked a little. Having the conductive traces touch your table is not so great, you can protect your Arduino by adding bumpers to the bottom. If you're working on a project that needs a lot of memory, you can free up 100 more bytes (10% of the RAM on an ATmega168!) by lessening the serial receive buffer. By default its 128 bytes, which is quite a bit! Near the top is a #define RX_BUFFER_SIZE 128, which means 128 bytes are used for the buffer. You can change this to 32 (or even 16!). If you have almost no serial input, make it as low as you'd like as long as its > 0. A lot of people start learning about microcontrollers with an Arduino but then want to build their own projects without having to sacrifice their dev board. Or maybe they want to make their own Arduino variant, that is compatible with the IDE. Either way, a common problem is how to burn the bootloader onto the fresh AVR chip. Since AVRs come blank, they need to be set up to be Arduino IDE compatible but to do that you need an AVR programmer (like the USBtinyISP). The good news is that you can burn bootloader using your existing Arduino with only a little bit of work. There's even a minitutorial on the arduino.cc site. This tutorial is an extention of that tutorial. First we'll show how you can make a permanent bootloader-burner by soldering a 28-pin ZIF socket to a proto shield and use the PWM output line of the Arduino to generate a clock. This will let you 'rescue' many chips that have been set to the wrong type of oscillator, or change ones that are set from external oscillator (most Arduino bootloaders) to internal (such as the lilypad). If you bought the kit from Adafruit, you'll have an extra few items such as a Piezo beeper, LEDs, buttons, etc. that you can use for the Standalone version of this project, just ignore them for now! Solder all 28 pins for a solid connection! Pin 1 to digital 10 - Blue Don't forget to bend the wire over underneath to connect to the ZIF socket pin when soldering!!! Follow the protoshield tutorial to solder in the Red LED into LED1 position, Green LED into LED2 position. Also solder in the two 1.0K resistors next to the LEDs. We'll use the LEDs as indicators. Then solder a wire from the LED2 breakout (white) to analog 0 and a wire from LED1 breakout (white) to digital 8. Finally, you'll need to solder on the header to allow the shield to be placed on, break the 0.1" male header and place it into the Arduino sockets. Then place the shield above on top to solder it in place. Time to load the sketch! Grab the code from our Github repository and paste it into a new sketch. Then upload it to the Arduino. On newer versions of the Arduino IDE, select Arduino as ISP from the Tools→Programmer menu, then select Burn Bootloader from the Tools menu. The Green LED will be on during the programming, when its done you'll see this message and the LED will turn off. Thats it! Don't forget, you can burn a few different kinds of bootloaders, such as Uno, Duemilanove, Lilypad so depending on your situation you may want to use one over the other. 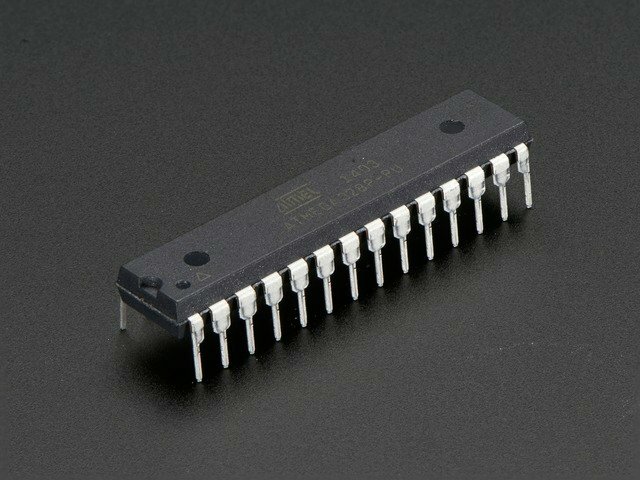 Instead of atmega328 you can also program atmega8 atmega88 atmega48 atmega168, etc. This guide was first published on Jan 12, 2013. It was last updated on Jan 12, 2013.